2012 – 2017 — This training was developed by UN-Habitat as trilogy, being part and parcel of a virtuous cycle of training and capacity building focusing on slum upgrading and the role of streets in the transformation of slums. The training program was offered in various occasions and for different audiences in Asia, Europe, Latin America and Africa from 2012 to 2017. It is a complete training package comprised of the strategy paper on Streets and Tools for Urban Transformation in Slums, the practical guide for planning, designing and implementing slum upgrading programmes and the training companion that includes all presentations, background and training materials. Participants attending this training have developed a full understanding of the phenomenon of informal urbanization and the appearance of slums and informal settlements. Course participants will develop practical knowledge and skills on planning and designing urban interventions using streets and the area-based plan for transforming and integrating slums into the city. The approach uses streets as the natural conduits that connect slums spatially and physically with the city and treats streets not only as a physical entity for mobility and accessibility — through which water and sewerage pipes, power lines, and drainage systems are laid – but also as the common good and the public domain where social, cultural and economic activities are articulated, reinforced and facilitated. Participants also develop knowledge on the design and management of citywide programmes that encompasses multiple slum upgrading projects. Acioly, Claudio (2014). Street-led Citywide Slum Upgrading. Global Urban Lecture. UN-Habitat (2012). Streets as tools for urban transformation in slums: a UN-HABITAT approach to citywide slum upgrading. Working paper. Nairobi, UN-Habitat. UN-Habitat (2014). 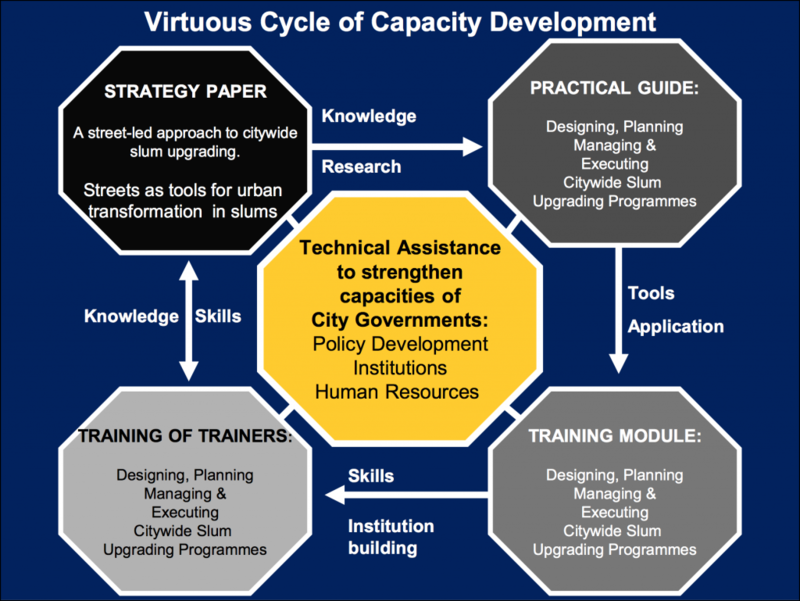 Practical Guide to Designing, Planning, and Executing Citywide Slum Upgrading Programmes. Street Led Slum Upgrading Training Module.